When given the choice, we prefer to build our clients websites using the Genesis Framework by Studiopress together with WordPress. It’s an extremely powerful content management system supported by an enormous ecosystem of designers and developers. While WordPress gives us a solid foundation right out of the box, there are necessary key features that must be added to really deliver the best possible web site to our clients. Fortunately, WordPress is extremely extensible and most of the key features that are lacking can be achieved by using one of the more than 17,000 WordPress Plugins currently available as of this posting. While we are a huge proponent of Plugins and use a wide variety of them to build specials features and functionality into our sites, we prefer to limit the number of Plugins used to the smallest possible number. This allows us to easily stay on top of updates and prevent possible conflicts between Plugins that are developed by several different publishers. Several years ago we began searching for ways to improve the usability and performance of WordPress without having to install multiple 3rd party plugins. That’s when we discovered and began using the Thesis framework. Although it made huge improvements to WordPress and simplified many of the tasks necessary for most of the sites we build, we continued our search for a better solution. 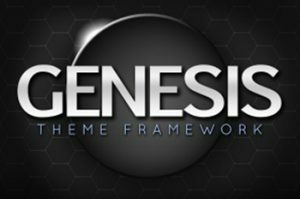 A few summers ago, while browsing through Chris Brogran’s blog, we cam across a post explaining why he moved his site to the Genesis Framework. He had previously used the same framework that we were using, but decided to change for some very compelling reasons. We browsed on over to Studiopress and was quickly sold. Here are just a few of the reasons why we prefer the Genesis Framework by Studiopress as the foundation for all of my WordPress driven web sites. Whether designing a custom child theme, turning another designers PSD into a child theme or modifying one of the 43 Genesis turn-key designs, we know we will achieve our standards faster using the Genesis Framework. This is achieved by separating all of the core functionality and SEO benefits of the Genesis Framework with the design elements of the child theme. That means we can quickly build or modify existing child themes to change the look and feel of the site without touching the original genesis code. Genesis improves the SEO capabilities of WordPress by using state of the art code and smart design architecture. This allows your sites content to be seen the way that search engines like it which in turn helps you to achieve the best rankings possible. In addition, Genesis allows us to update their framework without harming your important SEO settings. This means that you will always have the latest greatest version of Genesis running on your site. WordPress sites can be vulnerable to attack if not properly built and maintained. Genesis is constructed with state-of-the-art security built on WordPress best practices. Keeping your WordPress site up to date is breeze with Genesis. WordPress widgets allow us to quickly add powerful functionality to your site. Genesis gives us the ability to quickly create custom widget areas throughout our clients sites making widgets more powerful than ever. The Genesis theme option panel allows us to quickly and easily change things like font and font size, blog categories displayed, number of posts on a page and more. It also gives a quick an simple way to add custom code to the header and footer of every page. Genesis extends the comments functionality of WordPress giving your users a more robust discussion experiencing including comments threads and gravatar integration. Most of the existing Genesis child themes are advertising ready and building this capability into custom our child themes is cinch. Genesis simplifies the use of images on your site by taking advantage of the WordPress featured image capabilities. If your interested in learning more about Genesis, get in touch with me or head over to Studiopress.com and check it out for yourself.